Two years ago today we lost one of the greatest voices in rock and roll history ... Johnny Maestro. But in 1969 ... an incredible eleven years later ... Johnny made The Top Three again with a NEW band called The Brooklyn Bridge. Their biggest hit, "The Worst That Could Happen", reached #3 that year. Johnny continued to perform to sold-out crowds until health problems put him on the sidelines in 2010. He was a regular fixture on many of the PBS Oldies Music Shows and, from what I've been told by countless fans, he never failed to please his adoring audience. 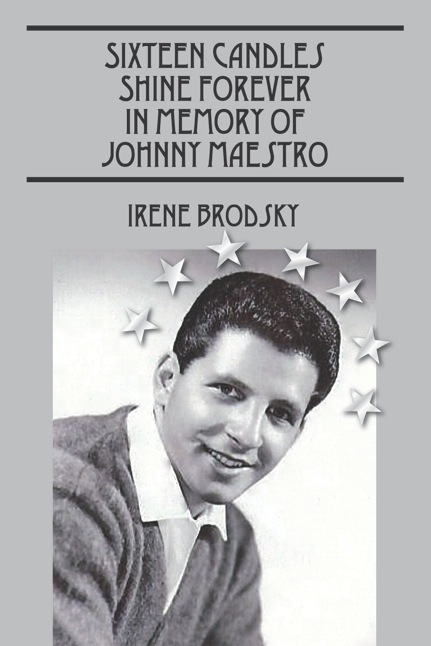 We recently told you about a brand new book covering the life of Johnny Maestro, written by Professor Irene Brodsky. In fact, Irene was kind enough to give away an autographed copy of her book to the Forgotten Hits Reader who came up with the best "Favorite Johnny Maestro Memory". The winner of our little FH contest is Nate Mehdi of West Palm Beach, Florida ... and an autographed copy of Irene's book is already on its way to him. Some years ago I attended an outdoor Brooklyn Bridge Concert, sponsored by a local politician, at Mt. Lorretto Playground in The Bronx. It was scheduled to begin at 7:30 pm but they started at 7 PM because of threatening weather. At about 7:15 there was a lightning and thunder storms and they had to stop.The politician arrived at about 7:30 and saw that the act had changed into their street clothes and asked what had happened. Johnny explained that it was too dangerous to perform with electronic equipment under the existing conditions. The politician threatened to stop payment on the check and asked Johnny to sing a few songs for the people. John, Les, Freddie, Marty and Jimmy Rosica ... all in street clothes ... commenced to do an a cappella set that lasted about an hour. It was one of the greatest concerts I ever attended! It was reminiscent of back in 1956-7 when Johnny & the Crests, including Patrica VanDross, used to sing a cappella at the Henry St. Settlement House in lower Manhattan. This was before they had recorded anything and John was still a student at Textil High School (now Charles Evans Hughes H.S.) Everyone who heard them knew that John was destined for greatness. I guess I had a proclivity for attending Brooklyn Bridge concerts in inclement weather. One summer night I went out to John Burns Park in Massapequa, NY, but the concert was moved to a local school because of bad weather. Due to limited seating, they were only allowing local residents into the venue. I did not qualify and had to sneak in through a back door to see another memorable concert. I was fortunate to attend John's last public performance at Mohegan Sun Casino in Connecticut in January, 2010. Even though he was very sick at the time, he gave his usual excellent performance. My favorite memory in watching and listening to Johnny for over a half a century is that he was a consummate professional who always gave a 100%. In all those many years his voice never wavered and he never gave a bad performance. Thanks for the memories John ... RIP. The photo on the front cover was taken by Bruno and I had to search all the way to Australia to find the new owner of the rights to that picture so I could get the authorization. That is why my book is precious to me. It comes from my heart. 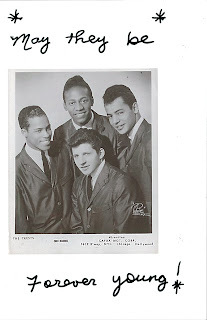 Irene also sent us an early picture of Johnny with The Crests, circa 1957. 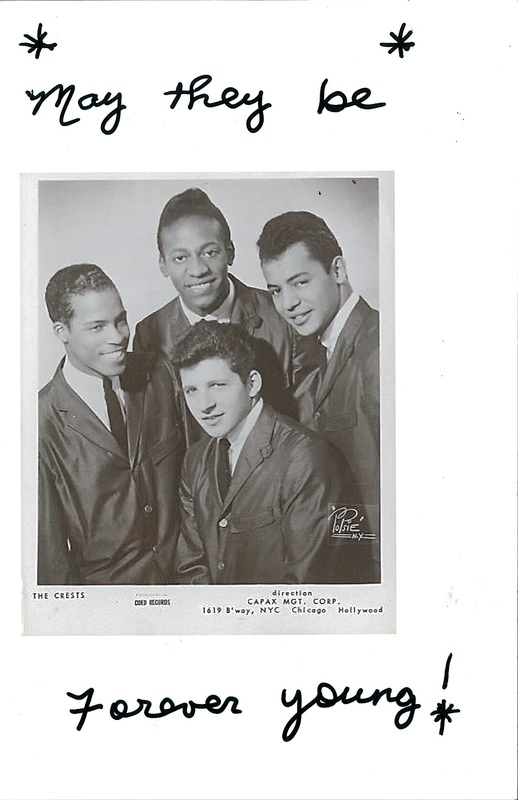 This attached image of Johnny And The Crests was taken by the famous photographer Popsie of NYC. I am proud to have been given authorization to include it in my book. My name is Professor Irene Brodsky and I want to thank everyone who entered the contest to win my new book "Sixteen Candles Shine Forever in Memory of Johnny Maestro". I congratulate the winner, Nate Mehdi. And thank you, Kent, for this event for a lucky winner to win my book. I am honored and I thank you. I also want to thank anyone who was kind enough to buy the book. Bless you from the bottom of my 65 year old heart. And all of you can write to me at Chayarochel@aol.com I would love to hear from all of you." When I saw and played the two choices you had today, I was immediately reminded of another record which was very big here in the OKC for another member of Hee Haw. I am talking about his novelty record of 1967 THE COCKFIGHT. It was a top 5 record here in the OKC area for Archie Campbell. To be honest with you, I was surprised it did all that well considering the 'fowl' language that was in it. Don't know if it made your surveys, but again a very big novelty record for one Mr. Campbell here in OKC. Your Sound Advice for today, believe me on this, was by a group whose record I just happened to play yesterday because I remembered it for one reason or another. Remember Ronny and the Daytonas' 1965 hit BUCKET "T"? I know you do. Thanks for spotlighting G.T.O. today. It was the first song I ever played on the radio and the memories came rushing back. I wonder how many jocks remember the first song they ever played on the air. When I saw the Sound Advice Cowsills selections today it reminded me of a song by them, “The Impossible Years”, from the movie of the same name. It plays over the opening credits and says written by The Tokens and performed by The Cowsills. Definitely an obscure song and, pardon the pun, Impossible to find. Does anybody out there have a copy of this song to share? Any help would be greatly appreciated. BTW, I'm really enjoying the Sound Advice stuff lately! I totally loved the story of how "The Mother and Child Reunion" song came about. Thanks! It's amazing sometimes how the most innocent phrase can inspire a talented songwriter like Paul Simon to craft an entire song ... with an entirely different meaning ... over something he saw listed on the menu. Love the website and Sound Advice! The Beau Brummels, The Blues Magoos, The Bobby Fuller Four, The Kingsmen, The Knickerbockers, The Leaves, Love, The Merry-Go-Round, The Music Machine, ? 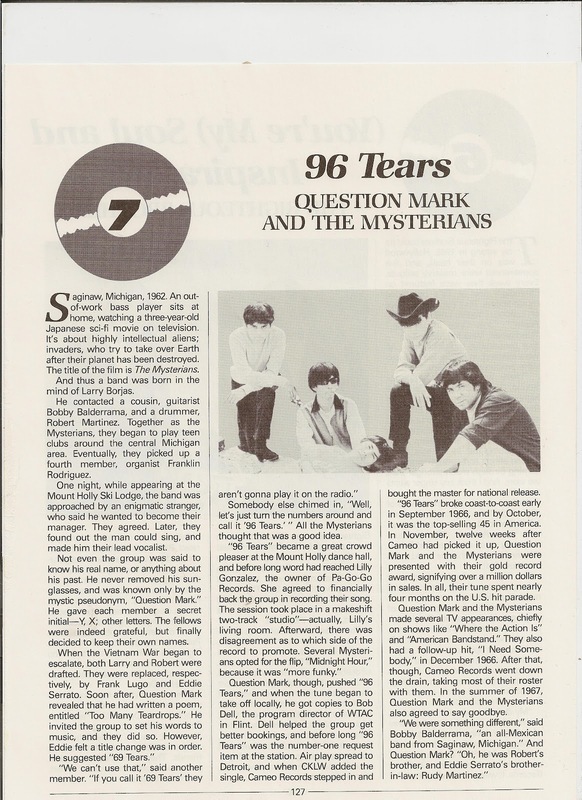 and the Mysterians, The Seeds, The Shadows Of Knight, The Sir Douglas Quintet and The Standells. (That's damn-near 20 favorites right there!!!) Remember, in order to qualify, the band had to have at least ONE charted record ... and "Bubbling Under" records count! Throughout the polling process, we'll be making suggestions of some of the artists you may have overlooked. Here's one for your consideration ... how about The Nightcrawlers and their Garage Band Classic "The Little Black Egg"! Although hailing from Daytona Beach, FL, this record was a smash in Florida, Ohio and Seattle, Washington, where it went all the way to #1! My vote goes to The "Bonniwell" Music Machine. As with all these labels, I guess the term "garage band" is open to interpretation, but I saw the Knickerbockers mentioned; based only on "Lies", I guess I could see that, but having seen them live, I wouldn't call them a garage band at all. They were a very good club band with a repertoire that included a wide variety of then current pop / rock (including Pet Clark's "I Know A Place"; they're the only band I ever heard do that song). I’m going to push this one again. I vote for the Fabulous Flippers. You might throw it out but their version of the Harlem Shuffle is the best. ... there are plenty of others, of course. But these songs are worthy of consideration. 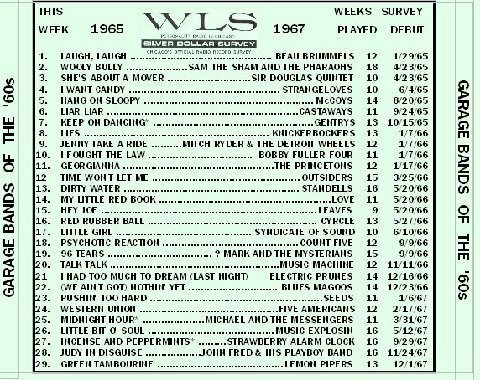 On your blog from 3/20 there is a photo of a cd of garage hits from WLS. Do you have an idea of how I can get a copy of this? Thanks! I enjoy your writing. I was involved in college radio in upstate NY from 1970 - 1974 and also at Penn State & Allentown, OA for a number of years after. There is only ONE garage band in the opinion of this Chicago born and bred boy ... the mighty SHADOWS OF KNIGHT! Gloria! Dark Side! Oh Yeah Bad Little Woman Willie Jean Shake! My vote is for the mighty SHADOWS OF KNIGHT. Best garage band period!!!!! Scott Smith, Shadows of Knight collector. I'm voting for the Shadows of Knight for one good reason. My friend Kenny Turkin was the drummer on Shake and toured with them for over a year. We were great friends from early childhood throughout his life, which ended way too soon. One Vote, please, for my friend Kenny! other bands covered in their acts. I'm voting for "I Fought The Law" by Bobby Fuller Four. And lost. Proving once again that "Crime Don't Pay". That sounds like it would've been a good title for a follow up to this hit. Hey Kent, Do you think it would be a good idea to go over the "Bobby Fuller Murder Case" one more time? LoL!! I can hear you cursing me out. LoL!! In these parts (SE Wisconsin) the Robbs were kings. Although they never cracked the Top 100 they are known as the most prolific "bubbling under" band of their time. My favorite is "Cynthia Loves It" but the best known is "Race With the Wind". The Robbs get my vote. Hope everyone emails their favorite Garage Band Songs. It will include a lot of songs we never hear any more. Thank you for using my idea. The master always comes thru! And, since you're out hitting the music polls anyway, let's not forget THIS little competition!!! It's our 5th annual I.R.S. ("It Really Shoulda" been a top 10 hit), and there's a little over a week left to file. Send your list of songs you think 'really shoulda' been top 10 hits to IRS104@verizon.net by April 1. When you do, you'll automatically qualify to win stuff from RadioLogoLand.com or the 4-disc set of the I.R.S. 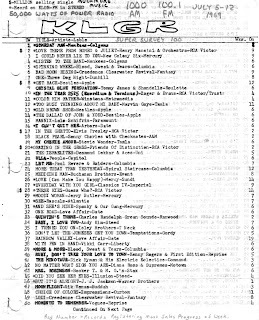 Top 104, the countdown of which kicks off Friday night April 13 on Rewound Radio (http://www.rewoundradio.com/) and heard in full Sat-Sun April 14-15 on my shows on WRNJ (http://wrnjradio.com/streaming). We always seem to get a good response to our radio rave-outs ... and, with something like 200 deejays on the list now, maybe it's time to officially start an "Inside Radio Memories" segment ... something that could run once or twice a month where jocks can share some of their favorite stories and memories with our readers ... great experiences ... CRAZY experiences ... ridiculous programming notes, ideas and promotions ... you get the idea. Well, maybe not THAT ridiculous ... but you see where we're headed with this! It will take some pretty good word of mouth but I'll betcha that if every jock on the list sent in a story ... and then encouraged three or four OTHER jocks that they're still in touch with to do the same ... this could turn into a VERY popular feature on The Forgotten Hits website. What do you guys think? Your very own Radio Forum. Let us hear from you and we'll see where it goes from here. Steve Hotvedt sounds like he worked at the same Omaha station I was speaking of in my original message about listening to radio. They also play just those two songs by Def Leppard. Must be the same consultant?? Some of these posts from the radio folk are really bringing back memories. I was on a Clear Channel classic rock station during the transition from CDs and live DJs to voice tracking and computers. For a while, it was great - no more pulling carts, cueing up CDs or wondering if the commercial on the log was really going to be there. But as with many emerging technologies, it quickly took the human element out of the picture, and the soul of radio began to die. The first time it really hit me was when the PD came in to tell me that I shouldn't play Van Halen's "Eruption" in front of "You Really Got Me," which is how it is heard on the album. The PD is a great guy and did a masterful job running the station, but corporate policy meant we had to stick to the playlist. The beginning of the end. To Clark Besch ... That's a wonderful set of memories! And from my point of view, the beginning of the "sea change" in radio was the takeover of so-called "music research" and "audience research" that happened in the 1970's ... creativity, instinct and "feel" were sacrificed for the security of research data. By the way, Mr. Weber is also having a "Rock N Roll Luncheon" on March 29 in Pelican Bay, Florida! He'll be offering up memories presented in his great book as well as new things happening in his life! Wish I could be there!! I see winter's over for you. 83 degrees in March? Wow! I just wanted you to know that "Airplay" is now available on amazon.com. Thanks again for being so supportive of our show. The Program Director of WGVU is Len O'Kelly, who was the overnight jock and Production Director at Real Oldies 1690 in Chicago. Please remember that the station is commercial free and listener upported. Len works cheap -- but not for free. Cool to hear YOU also made your own charts! 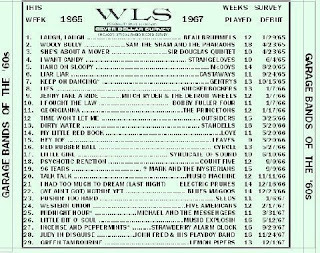 I was VERY into CFL and WLS and, now, KEYN-FM stereo in Wichita, but also VERY aware of Billboard and CashBox and often combined them all with my own tastes when creating my weekly charts. Here's one of my charts from July 5, 1969 firecracker time in Dodge City, Kansas. My "station" at the time was called KLGR (AM / FM simulcast). I just liked the sound of the calls. I had every intention of someday having such a station or being a DJ at WLS. I'll cover two bases with the personal chart AND the number one of "Someday Man," one of Davy Jones' BEST vocals. At this time in Dodge, we were able to get DJ copies of new pop / rock 45s from the local country station, so I could basically program my own station with brand new exclusives! The influences are seen on this chart. "Someday Man" was #1 knocking off 2 week #1 running "I Could Never Lie to You" by our beloved NC6. B side "Listen to the Band" was #4! It would peak at #2 the next week with Lincoln's "2525" Zager & Evans taking over #1. Note that I list the original Trust label 45 version along with the RCA 45 we had just received at the Dodge Station weeks earlier. It had been #1 in Lincoln when we came up for Easter months earlier to visit relatives. Billboard leaves impressions by being where I came up with the million seller info, "Romeo & Juliet" at #2 (not a fave, but because it was #1 nationally). I did not have any "bullet" so fast movers were designated by my writing OVER the typed title with felt tip pen to designate a big mover. KEYN-FM was represented by the "stereo" designations (if I had a song taped off KEYN in stereo, that counted as a stereo play as well as having a stereo 45). KEYN charters I grabbed would be their then #1 BST "More & More" even tho it was a B side, the Beatlesque "Ulla" by People (yep, same group as "I Love You"), the original 45 version of Illusion's "Did You See Her Eyes" before it became a hit with a remix version. Then, some 45s I just got as DJ copies and really dug were "Mannix" and "One Road." Other groovy 45s I got for free that were in my 51 - 130 charters included Cowsills' "Daniel & John" "Stay & Love me all Summer" by Brian Hyland, Hugo Montenegro's "Happy Together" "Wake Up" by Chambers Brothers, Crows' debut "Time To Make A Turn", the Association's "Yes I Will", Steve Miller's "My Dark Hour." Another great year of music, radio and pretending! BTW, my mom LIKED me typing up my lists weekly and listening to radio and music -- just "not so loud!". PS. Because of having the luxury of DJ copies, by the end of July, "Room at the Top" would be #1 on my chart. By the end of August, Chicago's first 45 with a rare pic sleeve, would get to the top. In September, the Buckinghams' "It's a Beautiful Day" would be near the top. In November, the Cryan Shames' "Rainmaker" would be #1 (knocking off NC6's "I Want You to Know") and eventually be knocked off #1 by NC6's "Barbara I Love You" in December! Looking BACK from the July 5 chart, the "Synthesis" cuts would be top 10 in June, "Only the Strong Survive" at top in May. 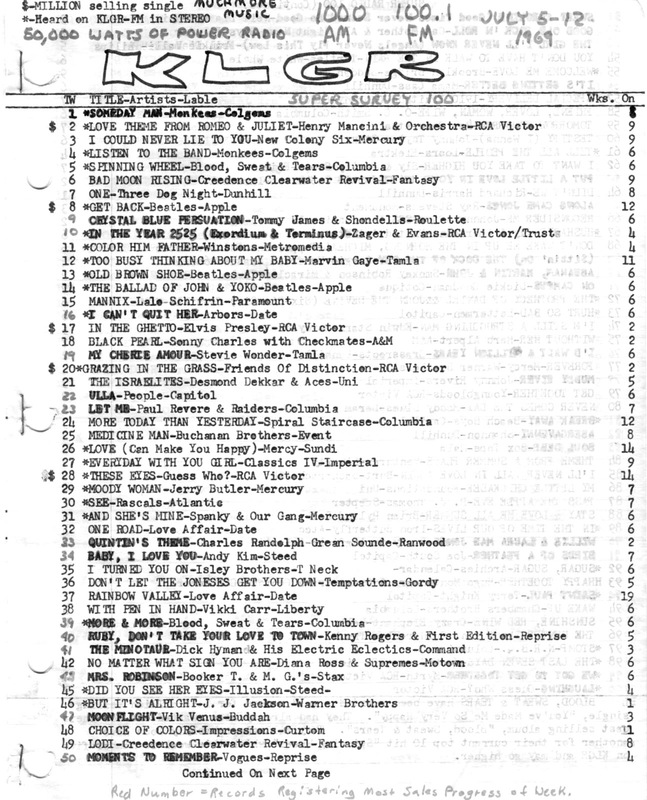 "First Train to California" was a month at #1 in April. Buckinghams' "Where Did You Come From" up top in February, with NC6's "Things I'd Like to Say" at #1 in January and lingering into April on the chart! 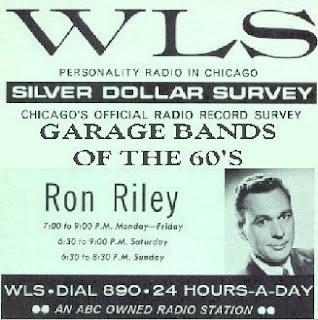 The Chicago sound seemed to be failing nationally in 69, but NOT at my house on MY station! I love reading Forgotten Hits ... keep up the good work! I know the status of radio these days is pathetic, nothing like we grew up with. I have checked out some online stations, some are good, some not so good, but I applaud everyone who is trying to keep the music alive. Is there anything like a 60's station -- say a WLS style station on the internet? Yeah, we get tired of 99 ads per hour, but couldn't there be a sponsored station with great jingles jocks music etc. to recreate what we grew up with? Seems as though some of the folks that put out packages of oldies -- Sundazed, Rhino, etc., could help sponsor some things too. Nobody will get rich in the beginning maybe, but it's a lot cheaper to do than a whole brick and mortar thing would be wouldn't it? Maybe I've had too much coffee this morning, or there's already one out there that I've missed? It's been tried ... but the whole prospect is just so INCREDIBLY expensive today, even on the Internet, that even expert radio veterans like John Rook (who recently tried to launch Hit Parade Radio with some GREAT names attached to it) threw in the towel. WOW! I've been listening to WGVU and I just looked at their playlist ... and in the past hour, they have played SO many faves that were more obscure! "She May Call You Up Tonight" by Left Banke! "Goin Home" by the Osmonds is arguably their best song. Play it back to back with Edgar Winter's "River's Risin'" and it will show you that when they were both out, it was "what's in the group name" that sometimes made a difference in AM to FM airplay. Almost the same tunes, but one by an FM'er and one by an AM'er! "Listen to the Band" by our beloved Monkees and one VERY surprising non-Hot 100 fave, the Tokens' "Greatest Moments in a Girls' Life" that I always had taped off a performance on Bandstand in 66 before eventually getting the pic sleeve 45. VERY COOL, guys! I have lots of GR radio surveys from the old days and you guys are doing a great job. Even playing The Bossmen!! Right on! Have you voted for YOUR Favorite Garage Bands yet? The polls are now officially open. Just send in your votes and nominations and we'll start to tally 'em up. And, just to keep things interesting, everyone who places a vote will automatically be registered to win a copy of a brand new, sealed Garage Band CD courtesy of our FH Buddy Mike Dugo of 60sgaragebands.com. In order to qualify, the artist had to place at least ONE record on the pop singles chart ... but, to keep things interesting, we're going to expand that criteria to include the "Bubbling Under" charts, where many of these more obscure tracks lingered for a week or two. And, just to get you started, you'll find some solid suggestions below! The Polls are now OFFICIALLY open ... we'll tabulate your votes thru June 1st ... and announce The Top 20 Favorite Garage Bands shortly after that. And if any of our oldies radio partners can help us to get the word out, I'd really appreciate it. Let's poll The Oldies Nation and determine Your All-Time Favorites! I have already made up a CD featuring the Garage Bands of the 60's. If you'd like a copy, let me know. Wow, Kent - That's a fantastic selection. Looks like the only one he didn't include that I listed is The Shadows Of Knight. There are some debatable acts (Cyrkle, John Fred) but we knew that there were be since the true definition of "garage band" has become blurred over time. The Seeds headlined the Hollywood Bowl, appeared on American Bandstand, appeared on a sitcom, and appeared in a movie. If that isn't a national big time rock band, nothing is - yet they are considered one of the quintessential garage bands. I'm also guessing doing a paragraph bio on each group won't be a problem either. It all sounds like a really fun idea to me ... and judging by the amount of comments you routinely get, I'm sure it will be a very lively poll. I guess the next steps will be to compile the Top 20 ... and I assume the songs should have charted if we expect people to be able to honestly vote. And, just to keep things interesting, I'll be more than happy to provide brand new / sealed CDs of two garage bands - The Chains and Those Guys - that I've released on my 60sgaragebands.com label as "prizes". These are 100% top-notch releases, with full band bios, rare photos, unreleased songs and jam-packed liner notes. I'll gladly send you one of each as well if you'd like to listen to some classy garage rock. As we've discussed, some of these push the boundaries of "garage band" ... but if we limited this to TRUE garage bands, I'm afraid nobody will know the groups or songs! The reason that the Shadows Of Knight (Mount Prospect, Prospect High School KNIGHTS where Jimmy Sohns and I went to high school in the late '60s) is not on the CD is that they are included in my Chicago Bands of the "60s compilation CD which I think you have. There are several groups on this CD which could be considered a Garage Band. For the record, since first mentioning this idea the other day, we've received just over a hundred votes and nominations so far ... 106 to be exact!!! So keep 'em coming, folks! Maybe some of our oldies radio partners can help to spread the word and direct their listeners over to The Forgotten Hits Website to cast their votes for THEIR all-time favorite Garage Bands of the '60's. Meanwhile, Mike Dugo and I will partner-up and put together the final list of your Top 20 Favorites ... we'll run the results on both websites and Mike will come up with a short bio on each band selected. Then we'll randomly give away a couple of those Garage Band CD's he mentioned earlier. If you'd like to vote for YOUR favorites, just drop us an email and we'll add your votes to the list. I'm not sure how long we'll keep the polls open yet ... let's see what kind of responses we get. 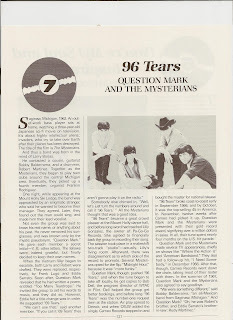 Was there some question about the story behind "96 Tears" and Question Mark & the Mysterians? I put the whole story in my book "The Top Ten." I'm not sure WHAT the question (about Question Mark) is!!! I don't recall seeing anything on this (nor is there anything specific mentioned in Carolyn's letter) ... so I'm really not sure. But, if you'd like to run your piece here in Forgotten Hits, I'd be most happy to do so. Thanks so much! You got them both. I'm still amazed at the difference in the Roosters number when the speed is reduced to 33 RPM. Much better at that speed. "Fun House" by the Roosters was originally on the Shar-Dee label. It became a favorite at Pittsburgh teen dances when it was played at 33, making the beat better for dancing. When it was picked up by Felsted, they made the "A hit sound if played at 33 1/3 rpm" notation on the label. Of course the most famous record to have its speed changed for Pittsburgh dances was "Hanky Panky". By that time the big teen dances run by Bob Mack had variable speed turntables. Mack sped the Snap record up and it took off locally. Even the early bootleg 45s on Snap were sped up, as was the official Roulette release. One of your readers today was interested in knowing the whereabouts of one Don Daniels with WMEX radio years ago. I thought I would run this by you and your readers since through the years, for whatever reason, I have always wanted to know what became of the following DJ here in the OKC area. Back in the 1960's there was a DJ by the name of Jim Bowman who worked for KOMA. He later moved over to top 40 rival WKY. During the mid-sixties on WKY from 7 PM to 12 Midnight he did a two man shift with a DJ by the name of Terry McGrew (now deceased). They called their show the "Gooseberry Show". Terry 'Berry' McGrew and Jim 'Goose' Bowman. Again, for some reason always wanted to know what ever became of Jim 'Goose' Bowman. Anyone know, would appreciate the information. Even former WKY jocks here in the city does not know of his whereabouts. So many folks out there don't realize what an important role some of these disc jockeys played in our lives growing up. (For the record, I'd venture to say there are people out there wondering "Whatever happened to Larry Neal? ", too!!!) Over time, you just lose touch ... get wrapped up in other things ... get distracted by real life and start listening to all that's up for offer these days. But MOST of us tend to reminisce about "the good old days" of Top 40 Radio and yearn for our favorites, thinking "Boy, if radio could only sound like THAT again!" I am putting together a CD of top songs used at sporting events. Is there a list of songs or can we ask your readers for suggestions? I found some lists on the web but I thing it does not include all songs. I WANTED YOU TO THANK YOU ALL FOR YOUR CALLS, LETTERS, AND FAXES. DR. MESSNER CALLED ME THIS MORNING AND TOLD ME THAT MY VISITING THERAPISTS WILL BE COMING BACK ON MONDAY AND MY STEM CELL PROCEDURES WILL RESUME AS SOON AS THEY CAN BE SCHEDULED. I WANT YOU TO THANK YOU AND YOUR READERS FOR ALL YOUR CALLS, LETTERS, AND FAXES. DR. MESSNER CALLED AND TOLD ME THAT MY VISITING THERAPISTS WILL BE COMING BACK ON MONDAY AND MY STEM CELL PROCEDURES WILL RESUME AS SOON AS THEY CAN BE SCHEDULED. HAVE A NICE WEEKEND ... I KNOW I WILL! I know this movie has been mentioned on Forgotten hits, but I can't remember if there were reviews or just publicity blurbs. Kent have you seen it?